Why Does Anyone Get Shock Wave Lithotripsy? Urinary stone disease is an important public health burden. Concomitant with other obesity-related conditions on the rise in the United States, this onus is increasing,1 and understanding best practices for effective management of kidney and ureteral stones would promote high-quality care for millions of Americans. 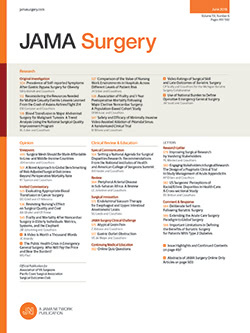 In this issue of JAMA Surgery, Scales et al2 applied instrumental variable analysis—an econometric technique that addresses confounding by the variables you can measure, such as age and comorbidity, as well as the unmeasured variables whose confounding can typically be addressed only through randomization—to compare the effectiveness of ureteroscopy (URS) and shock wave lithotripsy (SWL). The authors found that URS was associated with lower rates of retreatment within 4 months of the initial surgery.